The Church is made of people, not brick and windows. The Church is a group of believers, not a building. We come together to worship and learn from God’s Word so that we can be released into the world to fulfill the mission God has placed upon our lives! Jennifer and Martin have been married since July 15, 1995. The Lord has blessed them with two beautiful children, Jessica and David. Martin is a member of the Canadian Christian Ministers Association. 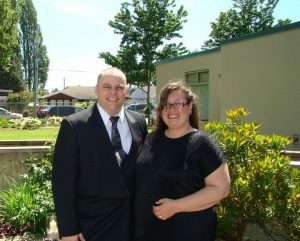 In 2008, Martin and Jennifer decided to follow the Lord’s leading to plant a church in South Surrey. Through the years, the Church has moved location and is now meeting in Langley. Our purpose has always been a simple one, to teach the Bible book by book, and to help believers to live a life that is pleasing to God. Our service is quite simple. We like to begin our time together by bringing our worship to God. Then, we take a small break to fellowship together while enjoying tea, coffee & hot chocolate. When we return, we pick up our Bibles and study God’s Word. Once a month we offer Communion and remember the sacrifice Jesus made on the cross for us. This usually takes place the second Sunday of every month.